Anton Diabelli is a guitar composer who differs in many respects from the usual guitar composer of the early nineteenth century. Most of the music he wrote was not for the guitar. He was active as a proof reader, publisher and in these capacities learned to know many leading musical personalities, such as Beethoven and Schubert, and had in many ways a central role in the music business in Vienna. Whereas guitar composers were usually players themselves, Diabelli’s activity as a performing artist is unknown. 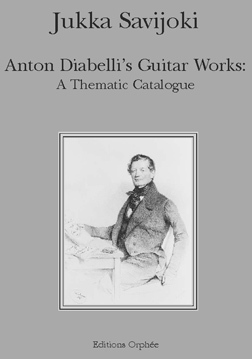 This catalogue details all the known works by Anton Diabelli for the guitar, the original as well as the arrangements, in many different forms. Jukka Savijoki graduated from the Sibelius Academy in Helsinki, Finland in 1997 with a PH.D. dissertation on Anton Diabelli and his guitar works. This book is a revised version of the dissertation. In January 1990 Jukka Savijoki was awarded a five-year scholarship from the State of Finland to promote his activities, being the first guitarist in Finland to be granted such a scholarship. As of September 2002 Jukka Savijoki is also the artistic director of the Sibelius-Academy concert series “Seria Classica.” Dr. Savijoki currently serves as a senior lecturer at the same institution. Since his debut at the Wigmore Hall, London in 1977, Jukka Savijoki has broadened his career as a solo guitarist through international concerts and several recordings. He has performed all over Europe, Japan and North and South America.